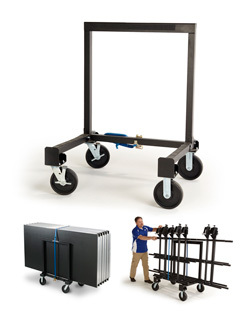 Universal Deck & Rail Cart stores up to six StageTek® Decks or six StageTek® Rails, up to eight Versalite® Decks or up to six STRATA® Decks. Fits through a 32" (81 cm) door. Please call your Wenger representative for ordering assistance.